I don’t know if this image will hit you the same way it hit me, but I still can’t get over it. 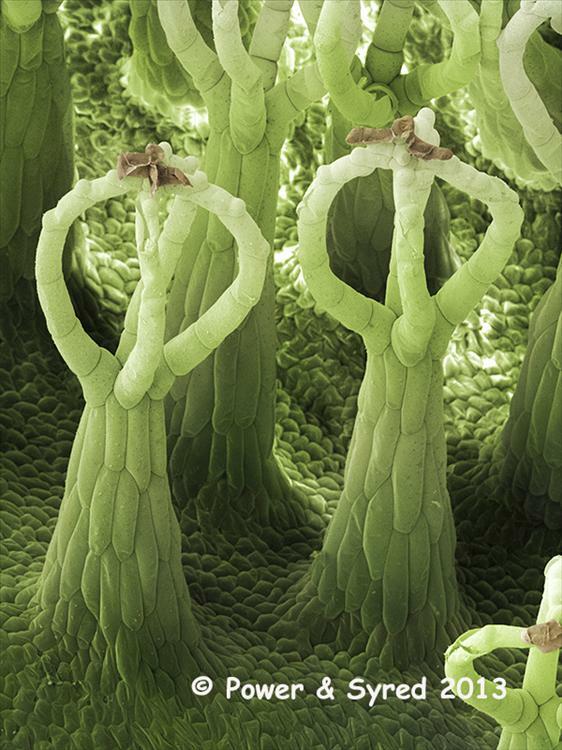 The lime green ballerinas pictured above are actually microscopic, water-repellant hairs found on the leaves of Salvinia natans, a plant known commonly as the water fern. Each hair, approximately a millimeter in length, is designed to trap a thin layer of air between the leaf and the surrounding water, thus increasing the plant’s buoyancy and stability. If you read science and botany journals, you’d quickly discover that this aquatic plant is considered an invasive pest owing to its ability to grow quickly into thick mats (up to 2 feet deep) that essentially extinguish all life in the depths beneath them. As a result, all manner of biological control agents have been deployed against them. However, owing to its unique water-shedding abilities, the water fern is making a move off the most-wanted list. And while there is a clear benefit to such a practical application, what I’d be more interested to explore is just how in the hell this plant evolved such brilliant and intricate structures in the first place. And how can these seemingly miraculous configurations be organized and executed time and time again? And what other as-yet-discovered phenomena are unfolding, just under our noses, within domains as “common” as a leaf?